No hot water for your shower, washing machine, or dishwasher? Follow these troubleshooting tips to restore the heat as quickly as possible. Q: Even though my shower was perfectly toasty when I hopped in, it quickly chilled until there was no hot water left at all—even an hour later. What gives? Bump up the thermostat. Ideal operating temperatures for a hot water heater are between 122 and 140 degrees Fahrenheit. A system running below this range risks not only a hot water deficit but also the potential for growth of Legionella bacteria, which are responsible for a severe form of pneumonia known as Legionnaires’ disease. If the water heater isn’t already set in the ideal range, adjust it. In 30 to 40 minutes, you can expect hot water to return, and within two hours the unit should reach a temperature that will prevent the growth of pathogens. Check the forecast. A sudden cold snap in your area can impact the effectiveness of your gas- or electric-powered water heater, even causing it to conk out. This most often occurs overnight, when the heater sits unused and temperatures plunge. If your recent weather aligns with this scenario and your boiler is still running, try turning the hot water heater up to its max in order to kick it back into gear. After a half hour, turn on a kitchen or bathroom faucet to see if the water warms up after running for a few minutes. If it does heat up, return the hot water heater settings back to normal operating temperature, or even raise it a few degrees higher than usual until the cold snap ends. Relight the pilot light. If your gas water heater’s pilot light has been snuffed out by a downdraft in a vent pipe on a stormy day or the breeze through an open window, see if you can relight it with ease following the instructions permanently affixed to the side of your unit. In some instances—such as when a water heater‘s pilot light sits in an enclosed burner chamber—you may need to call in a plumber. If, however, you smell gas while you’re sniffing out the problem, hightail it out of the house and call the gas company! Fix a faulty thermocouple. If you can successfully light the pilot light but the flame doesn’t stay on after you release the control knob, the thermocouple—a safety device that shuts off gas flow if it senses that the pilot light is out—may be at fault. The tip of this copper tube should be in the flame of the pilot light; if it’s out of line, it could need adjusting or replacing. Fortunately, a thermocouple costs only about $20 to replace and can be a DIY repair. Rekindle a blue flame. Is your water not so much frigid as it is lukewarm? Does your pilot light burn yellow rather than the standard blue? These are symptoms of a gas-to-air ratio problem. First, be aware that a yellow flame could mean that the boiler is releasing carbon monoxide, a colorless, odorless, and toxic gas. Check for drafts or open windows that might be causing the pilot light to burn inefficiently, and remedy the breezy situation. If this doesn’t return the pilot to a crisp, blue flame, call a technician to check out the unit. In the meantime, pay attention to any signs of carbon monoxide poisoning (dizziness, faintness, or nausea), and if necessary leave the house immediately to seek medical assistance. Inspect the gas line. If after turning the valve on you neither see a pilot light nor smell gas, the problem may lie with the fuel source. Check whether the gas valve is open or closed, and eyeball the gas line for any kinks that might be causing a roadblock. If you’ve adjusted the gas flow and nothing has improved, call the gas company to ensure that there’s service in your area and that your account isn’t in arrears. If the gas company assures you that you should have gas, yet turning the valve on still doesn’t produce gas (you’ll smell it if it’s there), then it’s probably time to contact a plumber or other professional. Restart your water heater. A current can go awry as a result of a power surge from an electrical storm. Try turning your electric unit off for a couple of minutes and then switch it back on. 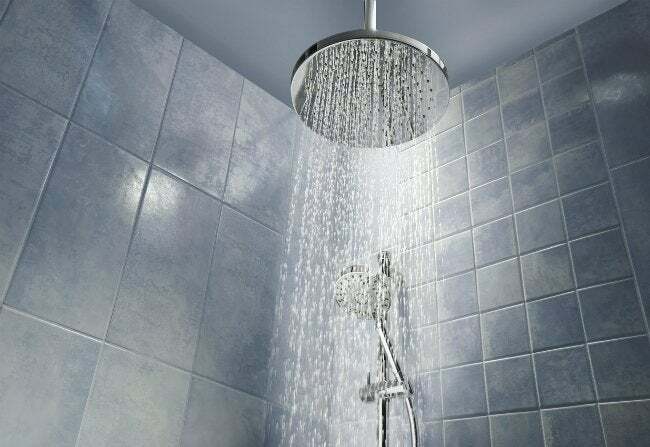 If after a half hour there’s still no hot water, you’ll need to move on to another solution. Proceed cautiously: Before you attempt to repair or even inspect the water heater, make sure the unit is off. These appliances draw enough power that an accidental electrocution could be fatal, so work carefully or call in a pro. Reset the circuit breaker. If tripped, the water heater’s dedicated breaker may not appear to be “off” but could still be just a little out of whack—not quite in line with the other “on” breakers. Flip it off, wait for 20 seconds, then flip it back on. A breaker that doesn’t hold the “on” position may have failed from age or overwork. If that’s the case, call on a professional for replacement. Call in the professionals. Concern over safety coupled with the technical nature of a water heater repair mean that it’s best to leave the work to the professionals. If your unit is not on its own breaker—or the breaker needs replacing—call a qualified electrician. 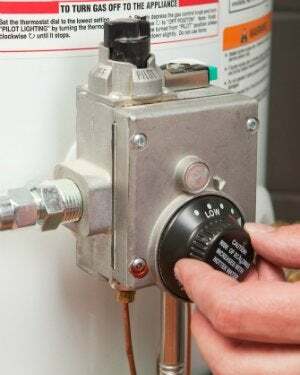 Or, if your tank leaks onto the ground or inside the heater’s compartments, bring in professionals to service your water heater before it damages the heating elements or stops thermostat function. Bear in mind that most hot water heaters are rated for only a 10-year life span. If yours is approaching a decade of use, its elements, thermostat, or other components may soon fail and need replacement. It may be smarter to replace your water heater altogether and capitalize on the improved energy efficiency that a newer unit would offer. Energy savings alone could make this a great time to invest in a new system.